Who doesn’t like a new crochet book? Certainly not me, since I’m a pattern junkie (aka: lover)!!! I’d like to tell you about a fabulous crochet book that I got at the end of September, just before taking a trip to China to visit my middle son, DIL and granddaughter. Since I got the book before the trip, it gave me some wonderful reading material for my trip! The book is called “Top-Down Crochet Sweaters” by Dora Ohrenstein, published by Storey Publishing. This book is a “gem” for any crocheter who would like to crochet top-down garments that will fit the intended wearer! Let’s face it, many of us can do a fabulous job of crocheting, but when it comes to making something that fits, that’s another story! I first met Dora at a CGOA conference (I can’t remember which year, but it was probably close to 10 years ago). For over 10 years, Dora has been one of the leading forces in the crochet world with lots of cutting-edge garments and designs! In the past, I tech edited some of her patterns for Rita Weiss and Jean Leinhauser, as well as for Crochet Today magazine. Dora is very ingenious with her designs! In 2011, I took 2 online classes with Dora on sizing garments. Then in 2013, I took Dora’s class (in person) at the CGOA Conference in Charlotte, NC on the same subject (for more practice and information). Dora is a wonderful teacher and a wealth of information! She is a lifelong New Yorker with a former life as a performing artist (soprano). In Dora’s new book, she has compiled all of her knowledge about crocheting top-down sweaters. 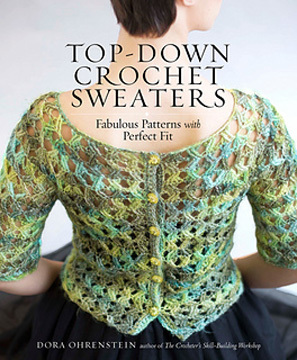 This book includes 14 original designs using the top-down technique, which allows crocheters to try the sweater on as they work, adjusting the fit along the way. The top-down sweater technique has been a favorite among knitters for a long time. 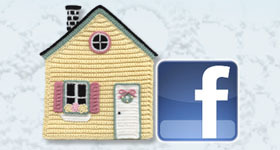 Now crocheters can enjoy this fabulous technique, as well! I definitely prefer to crochet top-down sweaters, which end up fitting me so much better than bottom-up sweaters! This book includes lots of information about choosing yarns and stitches to guarantee a great drape. It also includes instructions on why and how to adjust the patterns to ensure an exquisite customized fit. In this book, there are patterns for pullovers, cardigans, jackets, tunics and vests. Many of the patterns use only basic stitches. If you know me at all, I like the more advanced crochet stitches and a good challenge! There are patterns for me (and anyone like me) in this book, also! My personal favorites in Dora’s book are Luna and Nanette. Luna uses linked double treble stitches. If you’ve never done linked stitches, you should check them out soon! They’re amazing!!! The yarn that Dora used for this sweater is Knitpicks Stroll Tonal Sock yarn. I’ve been wanting to try this yarn for a while and I think this sweater would be a great project to make with it (plus I love the color)! Dora used a size I crochet hook, so the sweater has lots of drape! This looks like a very comfortable sweater! Nanette uses crossed treble stitches. I love the yarn that Dora used in this sweater (Queensland Collection Uluru), as well! I’m not sure I’d wear it with the buttons in the back, but I think it would be just fine to wear it with the buttons in the front, since the front and back have the same neckline. If I’ve whet your appetite to look closer at this book, you can check it out on Amazon here. The book has 176 pages and retails for $18.95 (in the US). If you’d like to see all 14 garment patterns in this book, check out the Raverly page for this book here. I hope you’ll take a look at this book and consider adding it to your crochet library (or purchasing it as a gift for a crochet-lover that you know)! What are your favorite projects in this book? Do you enjoy crocheting top-down sweaters, too? Photos excerpted from Top-Down Crochet Sweaters © 2016 by Dora Ohrenstein. Photography by © Melinda DiMauro. Used with permission by Storey Publishing. This entry was posted in Book review, Crochet book, crochet sweaters and tagged book review, crochet book, crochet sweaters. Bookmark the permalink.